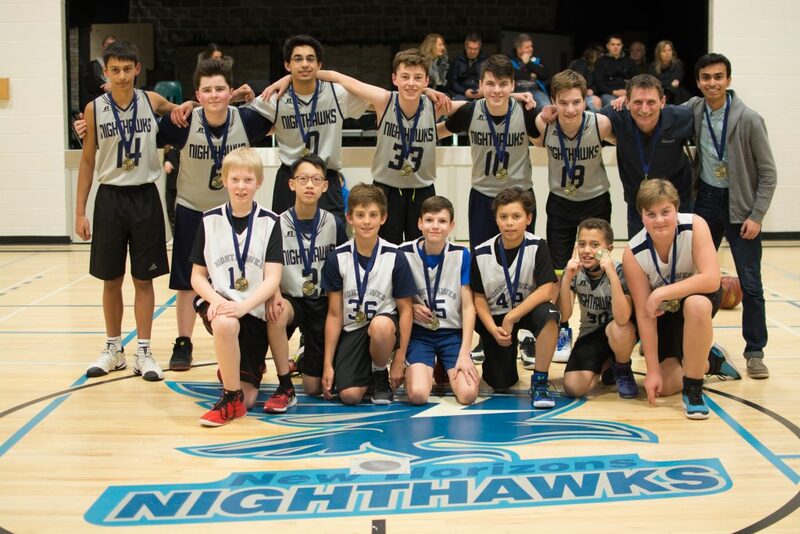 The New Horizons Nighthawks play in the Elk Island Catholic Schools “B” Basketball League, and both the girls and boys teams began the year on Thursday, January 10, with season-opener wins against the Holy Spirit Heat. The girls won their game with a score of 35-10 and the boys won their game with a score of 70-48. Over the January 11th and 12th weekend, New Horizons hosted an invitational basketball tournament with boys and girls teams from Holy Redeemer, St. Theresa, and Holy Spirit participating. The girls went through the round-robin with a win against Holy Spirit to take third spot. The New Horizons Nighthawks take the gold at their Invitational Tournament on January 11/12. The boys went through the round-robin undefeated and met the St. Theresa Hawks in the gold medal game. In an exciting contest, the boys pulled ahead in the final four minutes to defeat the Hawks 51-33 and capture the gold! Congratulations to both Nighthawks teams!